Since the start of the year I have been following Jillian of One Pink Hippo as she makes a Temperature Blanket. I'm feeling inspired to try something similar! The weather in Melbourne is so changeable that I'm sure the result would be very interesting. A blanket is a bit too much of a commitment for me at the moment: I really can't see myself crocheting/knitting a whole row every day. It's also a financial commitment to purchase enough yarn in enough different colours. A scarf seems much more manageable. I've been doing some research to work out the details. 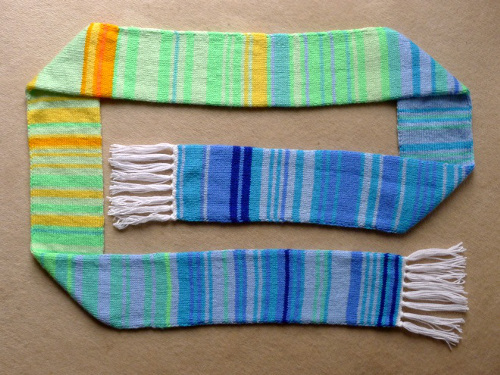 A Temperature Scarf/Blanket/etc is a conceptual project -- different colours are assigned to temperature ranges in your local area (e.g. on a 11-15 degree day, you might knit a light blue row; on a 6-10 degree day, a dark blue row). 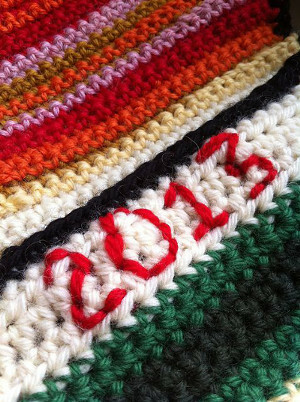 At the end of a year, you'll have a record of the daily temperature in crafty form. The project can take any form you like, any pattern, any combination of colours. There are so many ways of going about this project that it's a bit daunting! 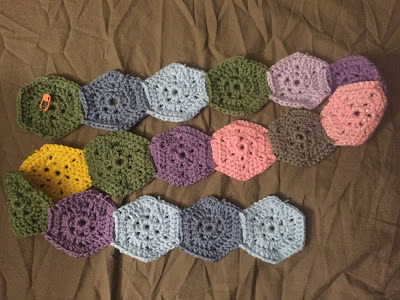 Jillian's method of making a hexagon-shaped granny square every day is cute and wouldn't take too much work, but on the downside, there will be a lot of ends to weave in, and she has to make adjustments to plan for the fact that 365 squares won't fit neatly into a square afghan. 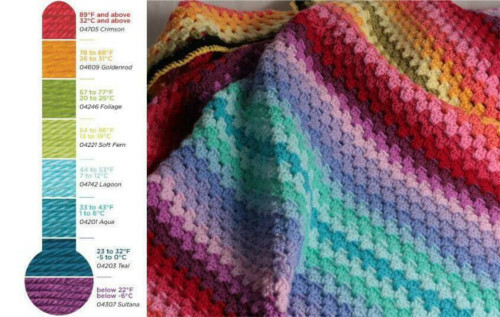 A straight granny stitch afghan. Picture SourceI had the idea of making 12 granny squares, one for each month, and a row for each day. That would make a nice blanket size/shape, and you could start the next month before finishing the previous one if you fall behind. However the downsides of that are: having to adjust for shorter/longer months to make the squares the same size; having increasingly long rounds to crochet by the end of each month; possibly many ends to weave in; not telling the 'temperature story' in a flowing way. Several others that I've seen made scarves using double/circular knitting, which I've done before in making the Harry Potter scarf. 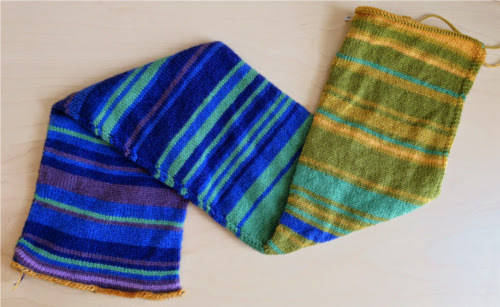 I'm really drawn to this idea, as there isn't too much knitting to have to do each day, I know it makes a nice smooshy scarf, and -- the BIG upside -- there's no weaving in. You can just knot the ends and hide them on the inside of the tube. The downside is that there's a visible jog in colour changes with this type of continuous knitting, but that can be hidden a bit on the edge of the scarf. A circular-knitted Temperature Scarf in progress. Picture SourceI also saw various other cute ideas such as: making the width the same number of stitches as the person's age; adding in a metallic thread on snowy days or important dates; making the stitches taller or narrower as the days grew longer or shorter; adding in a second narrower row between each main one to record the minimum temperature as well as the maximum. I adore the colours in this finished scarf. Picture SourceOf course, 1st January has well passed, but I feel like it would be more appropriate to start the scarf in Autumn, rather than the middle of Summer. So I'll wait until 1st March. That will give me a month to go through my stash and purchase any colours that I need, as well as think a little more about taking on a year-long commitment like this. That's a really interesting idea, I never heard of it before! It's a new idea for me too, and a very interesting one!